Greetings fellow ITAA members. I am very excited to serve as your President. We are welcoming three new members to the Council this year: Ann Paulins as President-Elect, Kim Hiller as Vice President of Education and Jung Ha-Brookshire as Vice President of Publications. The Council works diligently each year to ensure our organization thrives. If you have ideas to advance our mission, please share by reaching out to the appropriate Council member. I also want to acknowledge the excellent leadership provided by our outgoing Council members: Marianne Bickle – Counselor, Barbara Frasier – VP of Education, and Pamela Ulrich – VP of Publications. Their contributions have been valuable and provided the continuity required to keep the organization strong. One more acknowledgement I think is important to make before moving the focus to 2019. Kim Hahn and Linda Ohrn-McDaniel organized a great conference in Cleveland with the theme “Re-Imagine the Re-Newable”. I was pleased to see so many sessions include sustainability related scholarship, as sustainability education has been my passion for the past 20 years. I feel strongly that our discipline must prepare the next generation of young professionals for an industry transforming toward greater sustainability: to not only succeed, but also be catalysts of change. “Risk and Reward” is the theme for our 2019 annual conference in Las Vegas. Sheri Dragoo and Tammy Kinley are putting together a great program and I am looking forward to it. 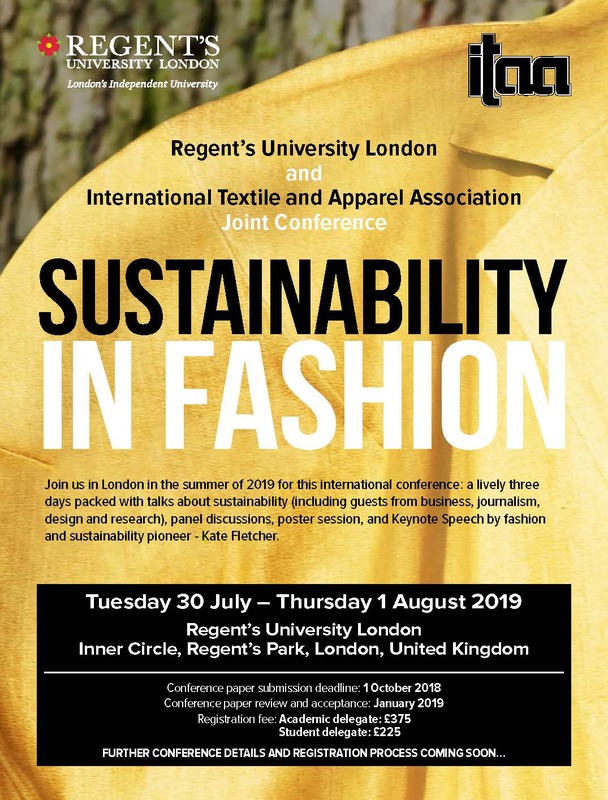 We also have a “Sustainability in Fashion” joint conference with Regent’s University this summer where we can enjoy focused attention on sustainability scholarship and practice. I hope to see you there. As most are aware, our Executive Director Nancy Rutherford will be retiring at the end of the year. Not only has Nancy been an excellent ED, but she has been someone that I have looked up to as a role model since my days as a graduate student at the University of Tennessee, Knoxville. My wonderful experience as a doctoral student at UTK was due to the culture of support and caring provided by the department. I believe the program culture was thanks to the department head, Nancy (Fair) Rutherford. I can never thank her enough for it. She carried this spirit of support and caring into her work as Executive Director and we have all benefited from it. I want to formally express my appreciation to her. A search committee for our next Executive Director has been formed and a search is underway. If you are interested, please apply. 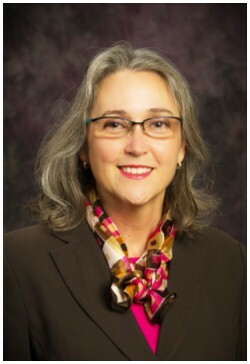 Or if you want to nominate someone, please reach out to the Search Committee Chair, Jane Hegland. Welcome to the new year and new semester! 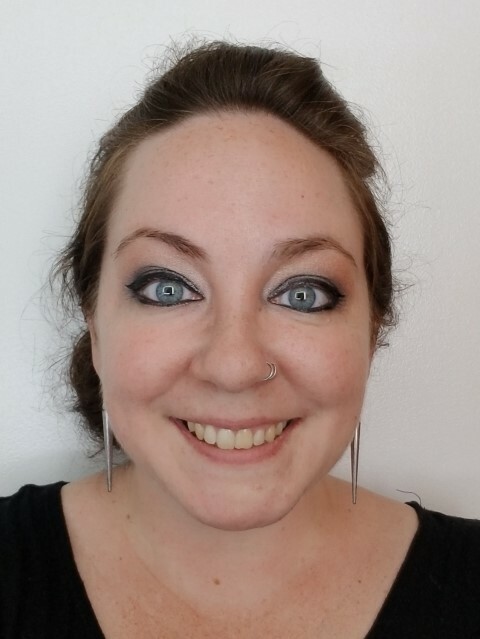 My name is Jenny Leigh Du Puis, and in 2019 I’ll be serving as your Graduate Student Liaison. I’m a first-year Apparel Design PhD student at Cornell University, and had a former professional life as a circus and theatrical costumer. I want to thank Sergio C. Bedford for all that he has done in the past year to guide the grad students in their ITAA adventures, not to mention all of the updates and information posted through the Facebook page. Thank you for everything! Speaking of the “ITAA Graduate Students Online Community” Facebook page, please join if you haven’t already done so! 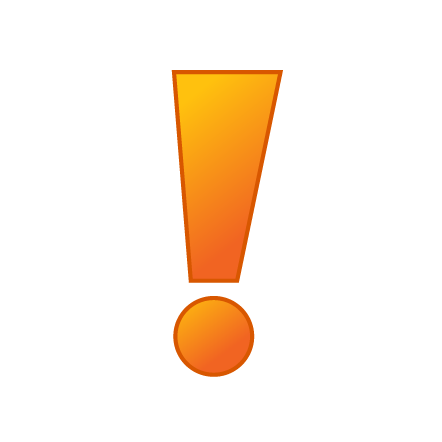 I’ll be posting information related to submission deadlines, calls for papers, industry news, and new features including student spotlights, publication congratulations, meeting and conference highlights, and more! If you are interested in being interviewed for a student spotlight, please send me a quick email (jld358@cornell.edu) and let me know. As graduate students (and adults), we are expected to bear the responsibility of work-life balance, research and teaching assistant tasks, homework, and a myriad of other elements that can easily add up to an overloaded plate. Having the support of other students who have been in your shoes can not only help to lighten the load, but also provide a perspective for others’ experiences. One of the most vital and important resources a graduate student can have is a supportive and knowledgeable network, and a way to communicate with them. As GSL, I’ll be acting as a voice for the larger graduate student community in representing your interests, questions, and concerns to the body of ITAA, and to bring news and information back from the governing body to you. Community, as an important part of graduate student life, isn’t just the people immediately around you – it can also be this network of fellow grads (thanks, Internet!) who may share interests, research directions, and/or tips and tricks from which others can gain knowledge. It is my intent throughout this year, to continue to build the ITAA graduate student community as a resource and network. I am excited to serve you all in this position! 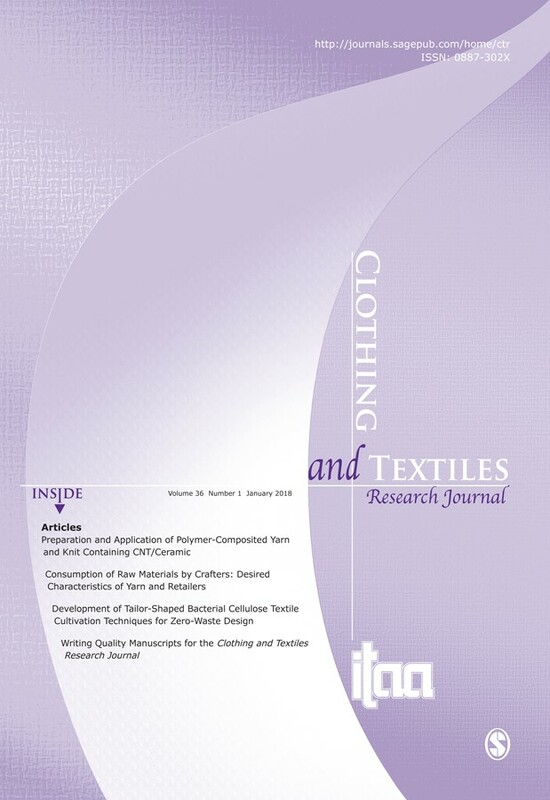 The Editor and Associate Editors of the Clothing and Textiles Research Journal, the Publication Policies Committee members, and the newly “retired” Vice-President for Publications, Pam Ulrich, would like to express their appreciation for all of the individuals who completed the review of one or more CTRJ manuscripts during 2018. The running/functioning of CTRJ is dependent on individuals like those listed below who support our journal every time they send in a completed review of one or more manuscripts. Publishing a quality peer review journal is only possible with the help of committed reviewers. I am particularly thankful for the majority of the reviewers who continued to review a manuscript through its various review cycles, kept to the review deadlines, and reviewed manuscripts during holidays, summer break, and in a timely manner. What is new with CTRJ ? Happy new year to you all! I wish all of you another great new year with lots of hopes and dreams. I am Jung Ha-Brookshire, a professor of Textile and Apparel Management at the University of Missouri and, starting this year, I am serving you all as the Vice President of Publication for the next 3 years. One of the key roles of VP of Publication is to promote and advocate our own journal, Clothing and Textiles Research Journal. I am writing this newsletter to give you updates on a few initiatives that we do. TAPAC has developed this Position Statement to help communicate the value of accreditation for textile, apparel and related area programs. We encourage you to use it in communicating the value of your TAPAC Affiliate Program Membership and your goal to achieve TAPAC Accreditation for your program. Please share it with your faculty, unit administrators, dean, provost, and industry leaders as well as with parents and potential students. Sage has changed how ITAA members can download CTRJ articles from the Sage Website. You no longer have to create a member account with Sage. Just use the "Access CTRJ Online" links on the ITAA website. You will need to sign onto the ITAA website to have member access. When you click on the link to go to the Sage website, you are visiting that website as an ITAA "Institution" member and can download full articles at no cost. If you already have a Member Account with Sage, you can still download files through your member account.